A MARINE wildlife expert from Brixham has described the killing of dolphins in South West waters as a 'massacre' – with over 100 found dead in just eight weeks. A total of 106 dolphins and porpoises have washed up on Cornwall's beaches and in the nets of fishing boats in just eight weeks, according to Cornwall Wildlife Trust. The toll for the whole of last year was 205 while in the two previous years the numbers had been under 100. Large trawlers are being blamed for the alarming increase – with French boats said to be the worst offenders as they work in pairs. It is understood they are competing with dolphins for fish such as mackerel, herring, bass and sprats and experts say they are wiping out entire family groups. The mammals get caught up in the nets used by trawlermen and are suffocated when held under the water. Lindy Hingley, founder of Brixham Sea Watch, said: "It's murder. It's a massacre. "It takes 20 minutes for them to die, and it's an appalling death." Reports the Express and Echo. Fifty-six dolphins and whales have washed up on beaches in Ireland so far this year making 2017 the worst on record for such strandings. The number of deaths is a fivefold increase on the same period in 2010. They have prompted an unprecedented meeting this week between experts from state marine and wildlife agencies and fishing and trawler organisations to discover what is killing so many of the species. 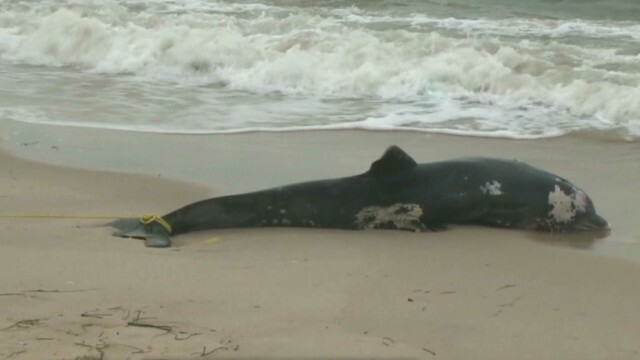 Pollution, trawler nets, disease, natural causes and inclement weather are all possible causes for the demise of the marine mammals whose beached bodies are being discovered almost every other day on some part of the coastline. Former taoiseach Charlie Haughey famously made Ireland the first whale and dolphin sanctuary in Europe in 1991 during his last term in office but this decade has seen more than 1,000 of the creatures stranding, reports the Irish Examiner. Fishing harms so many animals and in so many ways. Please don't support it. All of the nutrients derived from fish and other animals can instead be obtained more healthfully, humanely, and environmentally responsibly from plant sources. There are marvelous vegan versions of virtually every type of seafood imaginable. Google: vegan seafood resources.